After giving up a career as a trial lawyer, Shawn Askinosie threw himself into making chocolate. View a high-resolution version of this week's cover here. Chocolate makes people happy. That much scientists know. They're not sure what gives it its distinctive aroma, whether it's an addictive substance or if it really does function as an aphrodisiac. But they do know that the seeds of the cacao tree contain phenylethylamine, a chemical that stimulates the pleasure centers of the human brain and creates a warm, giddy feeling. By that standard, Alan McClure and Shawn Askinosie, makers of Patric and Askinosie Chocolate respectively, should be the two happiest men in Missouri. McClure works in Columbia, Askinosie in Springfield. They spend every day, sometimes for as long as eighteen hours, surrounded by cacao beans in various permutations: raw, roasted, liquefied, solidified and finally molded into bars of pure dark chocolate. Some may argue that they're also among the craziest. "You'd have to be insane to wake up one morning and say, 'I'm going to make chocolate,'" McClure admits. "To make chocolate is a complicated process," says Emily Duffelmeyer, the chocolate buyer at Zingerman's Delicatessen in Ann Arbor, Michigan, one of the few stores that sells both Patric and Askinosie. "There are lots of steps and opportunities to mess up. It's a very highly processed food. When I taste good chocolate, it's a miracle." Premium dark chocolate used to be a rarity in the United States. But in the past decade the heightened awareness of food that has made Americans start obsessing over the origins of the grapes in their wine or whether there's raw milk in their cheese has also made them pay closer attention to the amount of cacao in their chocolate. Twenty-five years ago the French company Valrhona figured out how to make a chocolate bar that was 70 percent cacao and 30 percent sugar, an event the New Yorker writer Bill Buford called "the chocolate world's equivalent of an airplane breaking the sound barrier." Within a few years 70 percent became the benchmark for fine chocolate, and it's now de rigueur for manufacturers to advertise the cocoa content on their packaging. A bar with that much cacao didn't need any extra fillers or flavorings. Instead, chocolate makers could, in McClure's words, "highlight and elevate the beauty and complexity of cacao's flavor." McClure uses Madagascar cacao in most of his chocolate. Its flavor is intense and complex, almost shocking, with notes of berries and a tannic aftertaste, like wine. It tastes healthy. "We're so used to thinking of chocolate as candy," McClure says. "But it's a healthy food — not health food, but healthy." In the past five years a few Americans — not just content to eat chocolate — have decided to try their hands at producing it. 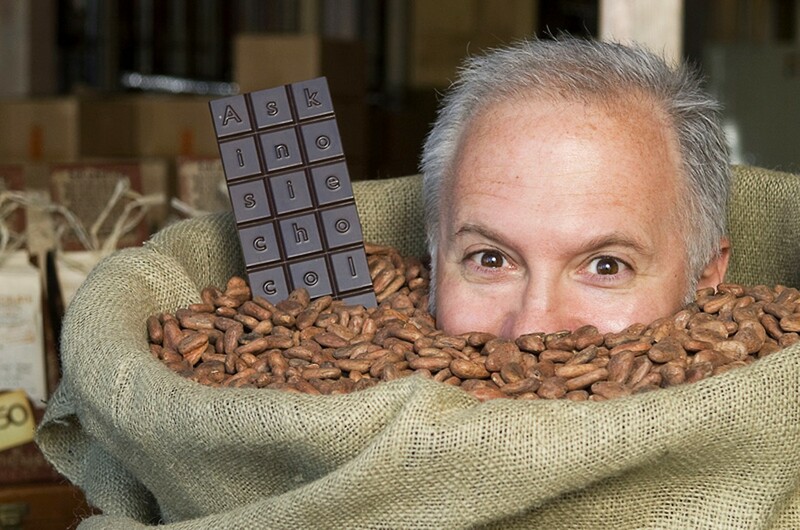 Clay Gordon, editor and publisher of the website the Chocolate Life and author of Discover Chocolate, estimates that there are now fourteen bean-to-bar chocolate makers in the United States. "Even Hershey's isn't a bean-to-bar chocolate maker anymore," he says. "They don't roast their own beans." To the shock of many in the chocolate world, including McClure and Askinosie, one of the centers of this new bean-to-bar movement is Missouri, a state that, in Gordon's words, "is not exactly known for leading food trends." "People kept asking me if I'd heard of the lawyer in Springfield who was making chocolate," McClure recalls. "I thought, 'That can't be true. 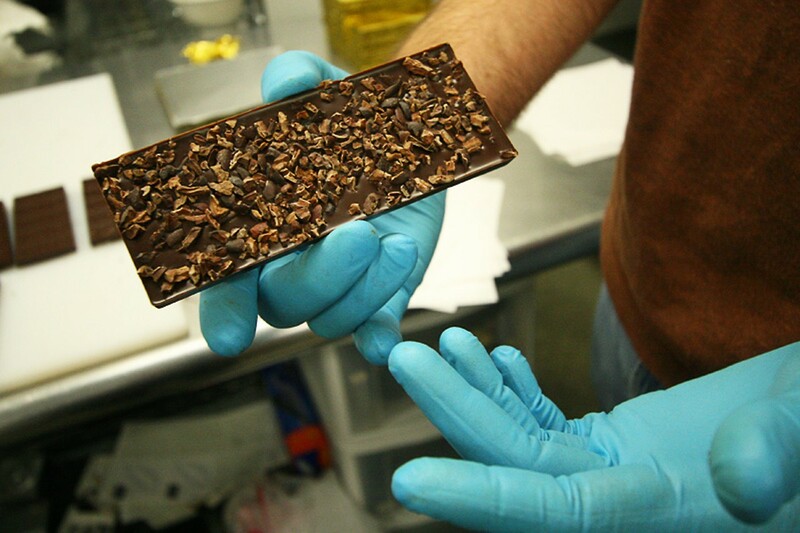 What are the chances of Missouri being the only state with two bean-to-bar chocolate makers?' 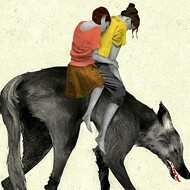 It was so unlikely, and neither of us knew about each other." Both Patric and Askinosie produced their first bars in 2007, about ten years after Scharffen Berger opened in Berkeley, California, and changed the American chocolate industry forever. Scharffen Berger was the country's first microbatch bean-to-bar chocolate maker, meaning it produced fewer than 250,000 pounds of chocolate per year. The venture was wildly successful — so successful that it sold out to Hershey's for $10 million in 2005. A bar of premium chocolate bears as much resemblance to a Hershey bar as a dry-aged steak does to a Big Mac. The price difference is comparable, too: A 1.75-ounce Patric bar sells for $6.25, and a slightly weightier Askinosie for between $8 and $10. 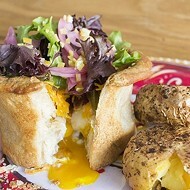 In St. Louis you can buy Patric at Harvest, Northwest Coffee Roasting Company and Whole Foods, among other places. Askinosie is available at Straub's, Winslow's Home and the Wine Merchant. "People are educating themselves to know the difference," says Gordon, "and they're more willing to spend what it takes to buy a great product. Chocolate is one of the least expensive gourmet foods in the world. The price difference between the everyday and the really good is very narrow. Bonnard makes a $22 bar that's the most expensive in the world. Even at $22 a bar, you can buy a bar of the best chocolate every week. You can't do that with the best bottle of wine." French chocolate expert Chloë Doutre-Roussel considers Patric Chocolate some of best in the world, and Askinosie's not far behind. "Americans realized quite late that bean-to-bar was growing, but when they did it, they did it well and fast," she explains. "It's a very American attitude to change your profession and put all your money and energy into a new venture and make it happen." Americans have also revolutionized the conception of how chocolate should taste. "Alan's chocolate is really wild," says Duffelmeyer. "It takes the tongue and wrestles with it. Shawn's stuff is also very robust, not delicate and nuanced like the French. Chloë compares European chocolate to a dapper older gentleman in a suit. Shawn and Alan are the guys in the Hawaiian shirt with spiky hair. "When people taste chocolate like Askinosie or Patric," she continues, "you can see them having an 'aha' moment. They're thinking, 'This isn't candy; this is chocolate. And chocolate is an amazing food.'" It's a bitter cold January morning, and the air inside the Patric Chocolate factory, located in a tiny industrial park on the outskirts of Columbia, is redolent of something acrid and sharp. If you sniff hard, you can detect a hint of cocoa. Then your eyes water. The smell emanates from the melanger, a 600-pound machine that takes up most of a small room in the back of the factory. McClure lifts the lid. Two heavy granite wheels churn through a viscous brown liquid, warmed by friction and infrared heaters mounted on the outside of the tank. "That's cocoa and sugar," McClure says. "It's impressive to see how liquid it is already." Three hours earlier, McClure filled the melanger with 56 pounds of cacao and 24 pounds of cane sugar and flipped the "on" switch. It will run for the next four days. The heavy wheels will refine the sugar and cocoa particles, and the heat will evaporate impurities such as acetic acid, which, it turns out, is the source of the vinegary stench. "It's not a pleasant flavor," McClure admits, though he does allow that the aroma is effective in opening up one's sinuses. McClure is 31 years old. He has colorful tattoos on his forearms, hipster glasses and a thick light-brown goatee. He majored in religious studies at the University of Missouri but knew early on that he wanted to work with food. The prospect of 60 hours a week in a restaurant kitchen, however, made him sick. A year living in Lyon, France, his wife Vivianne's hometown, acquainted him with fine European chocolate. Back in Columbia, he and Vivianne would sit at their kitchen table and have tastings, then enter their findings into a database — like wine snobs. "Looking back," McClure says, "I realize I didn't have a clue." One day he cooked a turkey with mole sauce made from cacao beans he'd bought on the Internet and toasted in a skillet over the stove. "It was amazing," he recalls. "Aside from growing the vegetables and raising the bird, it was all from scratch. It was a pleasure to do that." He began to wonder if there might be a future for him in chocolate. "I was a religious studies major. There weren't that many options. I had the money [from an inheritance]. I didn't want to spend it because I was out of work." So he went into business, which he gave his own middle name, minus the final "K."
McClure is something of a chocolate scholar. He has a file drawer of scientific papers about the nature of cacao and, before he got too busy, kept a blog that investigated such esoteric questions as whether the cacao pod is a berry or a drupe. "That's the mystery of the cocoa bean," he marvels. "It's hard and crunchy, and then it turns into a liquid. It's such a unique plant. Nothing tastes the same or has the same texture. I can't find another fruit like cacao — and I've looked." The cacao plant's official Latin name is Theobroma cacao, the food of the gods. It's a tall, prickly tropical tree with shiny green leaves and seed pods the approximate size, shape and color of footballs. The white pulp inside the pods is sweet and good to eat. But nearly 2,000 years ago, the Olmecs of Central America discovered the plant's chief glory: When the seeds were dried, fermented, roasted over the fire, ground into a fine powder and mixed with water, chiles and vanilla, they made a very tasty drink. By the time Spanish explorers landed in the New World in the sixteenth century, cacao had become one of the region's most valuable commodities. The Aztecs used the beans as currency and in religious ceremonies, and only the very wealthy could afford to drink xocolatl. The emperor Montezuma was said to consume 50 cups a night to fortify himself for his harem, which led to cacao's later reputation as a powerful aphrodisiac. The explorers brought these wondrous beans home to Spain and tried to keep them secret from the rest of Europe. They were unsuccessful: By the mid-seventeenth century, ground cacao — corrupted by English speakers into "cocoa" — mixed with warm milk had become a beloved morning drink throughout the continent. In 1876 a Swiss confectioner named Daniel Peter figured out how to mix dehydrated milk with chocolate and sugar and mold it into bars. The result was sweet and cheap and wildly popular. Peter and his neighbor, Henri Nestlé, kept their formula a closely guarded secret and set out to conquer the world candy market. Naturally, the Americans tried to make their own approximation of milk chocolate. Milton Hershey's version came the closest to the original, but his milk was slightly sour. Most people still preferred it to the more bitter dark variety. From 1905, when he opened his first factory in Pennsylvania, Hershey's chocolate dominated in the United States, home to more chocoholics than any country in the world. Askinosie Chocolate occupies a 115-year-old rehabbed building on Springfield's East Commercial Street. On Tuesday afternoons, Shawn Askinosie opens his factory to the public for tours. Visitors can admire the shiny metal machines and the network of ceiling pipes that carries the molten chocolate from one room to another. At a small counter at the very front, they can buy chocolate bars wrapped in Askinosie's distinctive brown paper packaging. The truly smitten purchase the "C-Ration," a box that contains a month's supply of chocolate: three squares a day, plus four extra for emergencies. The factory is bright, clean, modern — and completely out of place on Commercial Street. The only other signs of life on the block are an Ace Hardware and a pair of rainbow-painted storefronts that house a social-service agency for gays. Across the street is an empty lot, and beyond that, railroad tracks. Once upon a time, Commercial was Springfield's main street. The grand old Missouri Hotel, a block away, is now a homeless shelter. "This is a blighted area," says Askinosie. "It's starting a revitalization. It's important for us to be on this street. Eighty kids a night sleep at the Missouri Hotel. They come here for parties. They help us make chocolate truffles and dip strawberries." Most of the kids are part of Chocolate University, Askinosie's community-education program funded, in part, by proceeds from the factory tours. Fifth graders at Boyd Elementary School incorporate chocolate into all of their classes: When they study machines, they visit the factory, and during geography, Askinosie comes to the classroom to tell them about countries he's visited to buy cacao beans. Meanwhile, the student council at Pipkin Middle School, with Askinosie's help, is raising money to buy a computer so they can Skype with kids in Davao, Philippines, near one of the farms where Askinosie Chocolate buys its cacao. A group of students from Central High School consults with Askinosie twice a week about where in Africa he should source his next batch of beans. This summer, if they're able to raise the necessary funds, they will all travel to either Liberia or Tanzania on a buying expedition. "Chocolate University is a very big part of what we do," Askinosie explains. "Obviously, I want to make a profit and be successful, but part of what age gives me — other than a lack of hair — is perspective. Having a connection to the community makes me obligated to be a part of it and involve it in what I'm doing." Askinosie is 48 years old. He has a compact build, silver hair and beard, and eyes the color of chocolate. For twenty years, he was a criminal-defense lawyer specializing in murder cases, a few of which were featured on America's Most Wanted. It was, he says, a very stressful job. He started cooking to relax. First he tried grilling and then switched to baking cupcakes "because I liked tasting the outcome." For five years, he prayed for guidance about what he should do if he gave up law. He considered buying a bakery in Santa Fe, New Mexico. One day in May of 2005, driving to a great-aunt's funeral an hour outside of Springfield, he had an epiphany: He should make chocolate. Nonetheless, he started experimenting with roasting and grinding cocoa beans, first at home, and then, after his wife, Caron, kicked him out because he made such a mess, in his law office kitchen. In the mornings he would go to court, and then in the afternoons he made chocolate with the assistance of the paralegals. He traveled to Ecuador to work for a week in a chocolate factory to find out how the process worked on a larger scale. He befriended agricultural anthropologists and American commercial chocolate manufacturers, including one who worked for Mars, who could give him leads on finding cacao farmers who grew beans with the flavors he wanted. Like grapes and coffee beans, cacao absorbs the chemical components of the soil in which it's grown, what wine experts call terroir. "Flavor profiles of beans from Madagascar have red berry notes, like strawberry or raspberry," explains Alexandra Leaf, a culinary educator who runs Chocolate Tours of New York City. "Beans from Ghana tend to be fudgy and chocolatey. Cocoa beans are 50 percent fat. They're susceptible to sucking up flavor. Beans from Indonesia taste smoky because they're dried next to the fire." Most commercial chocolate producers get their beans from Ivory Coast, where cacao is plentiful and cheap. The flavor may be inferior, but manufacturers can disguise that with over-roasting and additives like vanilla. "You can tell the quality of chocolate from the smell," Leaf adds. "It should not smell like vanilla." Chocolate has one of the most complex flavor profiles of any food on Earth. According to McClure's scientific papers, it contains more than 600 aromatic components. "This smells nutty, coffeelike, chocolatey," McClure says, inhaling the scent of a handful of beans he roasted a few days earlier. "There's fermentation notes in here and lactic acid but also cheese." He sniffs again. "Gruyère." When McClure and Askinosie consider using a particular bean, they subject the samples to considerable scrutiny, not just making test batches but examining the color and structure of the beans and even cutting them open to inspect the insides. They also investigate the farms where the beans were grown to make sure they don't use pesticides or child slavery, a distressingly common form of labor on cocoa plantations. Both pay considerably more than fair-trade prices for their beans. "The best quality is the most expensive," McClure explains. McClure gets his beans from Madagascar's Sambirano Valley and the Paria Peninsula in Venezuela. Askinosie's come from San José del Tambo, Ecuador; Soconusco, Mexico (once conquered by the Aztecs for its cacao); and Davao, Philippines. He is the first chocolate maker to import beans from Davao in more than 30 years. Many of the farmers, he says, have never seen a chocolate bar. "Sourcing a bean is harder than a murder trial," Askinosie sighs. "It was one of the hardest things I've ever done in my life." And that was before he made his first chocolate bar. Most commercial manufacturers guard their processes as closely as Willy Wonka in Roald Dahl's Charlie and the Chocolate Factory, where "no one ever went in and no one ever went out." Certain principles are understood. Cacao beans must be roasted. Someone has to crack the beans open and separate the shells from the nibs, the "meat." The nibs need to be ground together with sugar into a mixture called chocolate liquor. The liquor gets heated in a machine called a concher (so called because the earliest models looked like conch shells) to refine the texture and evaporate impurities. Finally, the liquid chocolate is tempered, or slowly cooled, and then reheated to a very particular temperature to stabilize the fat molecules and keep the sugar from crystallizing. Without it, the chocolate would be a dull brown with speckles of pale yellow sugar crystals — beautiful in its own way, but not particularly appetizing. After tempering, you can pour the chocolate into a mold and cool it. Et voilà! You have a chocolate bar. It sounds, if not simple, then doable with the right equipment. But nobody manufactures chocolate-making machines anymore, at least not for companies that operate on the scale of Patric and Askinosie. After an extensive international search, Askinosie found himself with a roaster from Colombia, a melanger from Germany, a 100-year-old concher from Italy and a defective tempering system from Ecuador. "There were times," he says, "I wanted to drive a backhoe into the building and bury it." After four months of struggling, he finally gave in and purchased a new system from Germany. McClure, working with a smaller start-up budget, couldn't afford to buy old machines. Instead, though he had previously shown no inclination for things mechanical, he found himself tinkering with beer- and bread-making machines to make them process cocoa beans. "Once you realize what the principles are, you don't have to use a machine that was built for chocolate," he explains. "It's about controlling the machine and understanding what it does." 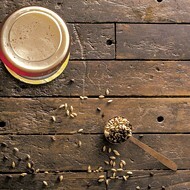 He roasts his beans in a commercial oven and cracks them open in a machine originally intended to crack barley for beer. (It was manufactured, much to his amusement, by a company called Crankenstein.) His melanger was originally used to prepare the batter for Indian bread. He doesn't have a concher because he read in one of his books that the melanger, given enough time, could do the same job. But he, too, had trouble with his tempering equipment and had to buy a second machine; he now uses the first, which cost $12,000, as a holding tank. "Manufacturers of tempering equipment will lie to you about what it can do," he says bitterly. "After I heard Shawn's story, I shouldn't have stuck with my machine. But you start to doubt yourself: Is it the machine's fault or yours?" "It was very, very stressful," Malone says of the process of learning to make chocolate. "But now I'm glad. I learned a lot more through trial and error. It helps you get to know your product better. The neat thing about chocolate is, if two factories use the same beans, they'll taste totally different because of the roasting profile and the time in the concher." "When I started," says McClure, "there weren't many other people using Madagascar beans. Now there are, and it's annoying. My chocolate's unique, but I can't prove it's because of the machine and the way I'm using it. Some part of the flavor profile is due to that, but when you're dealing with flavor, you make your best guesses. Even scientists don't know why chocolate tastes the way it does." "Chocolate making is one of those professions that's almost a calling," muses Clay Gordon. "Making money at it is a lot harder than people think. It's a hard business. It's not like, if you make it, people will buy it, and you will be successful." The profit margin on premium chocolate is slim. Still, three years in, Askinosie Chocolate has started to turn a small profit. It produces fourteen tons of chocolate per year. Patric produces just two tons. "This is quite literally less than what most chocolate manufacturers do in an hour," McClure writes in an e-mail. 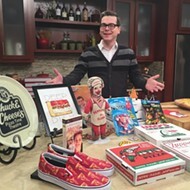 International sales represent a high percentage of Askinosie's gross revenue, which he says is a great help in an economic climate where the euro is worth more than the U.S. dollar. But one of the main reasons for his success is his talent for marketing. "Shawn's great at marketing," says McClure. "I have more respect for him as a marketer than for anyone else in the business. His vision is clear: to tell the story of the farmers. People feel good about buying his chocolate." The packaging of each bar of Askinosie Chocolate features a picture of the actual farmer who grew the cacao. It also has a "choc-o-lot" number one can enter on the company's website to find out more about the cacao plantation and the production process in Springfield. 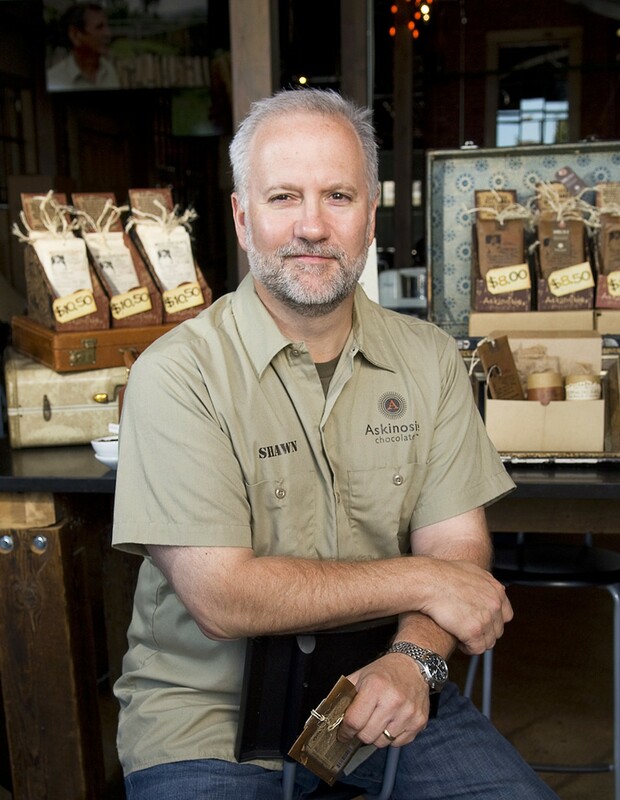 Unlike McClure and many other producers of fine chocolate, Askinosie sells white chocolate (made from cocoa butter, pressed from the same beans he uses for his dark chocolate bars) and a blend he calls "dark milk." He's also collaborated with Zingerman's on a bar called El Rústico that contains chopped-up vanilla beans. Askinosie admits to being more inspired by other industries than he is by chocolate. One of his chief mentors was Springfield businessman Jack Stack whose book A Stake in the Outcome recommends that owners keep open books and share the profits with their employees. Askinosie takes this one step further by sharing his profits with the cacao farmers, too. McClure, on the other hand, keeps close tabs on the industry. Next to his file cabinet of scientific papers is a shelf of rival chocolate bars, which he encourages his employees to sample. Chocolate production, for him, is a form of self-expression. 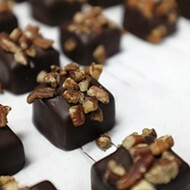 "Steve DeVries is an incredible chocolate maker," he says, "very detail-oriented. He's not as into food as I am. He's in it for the love of the game. 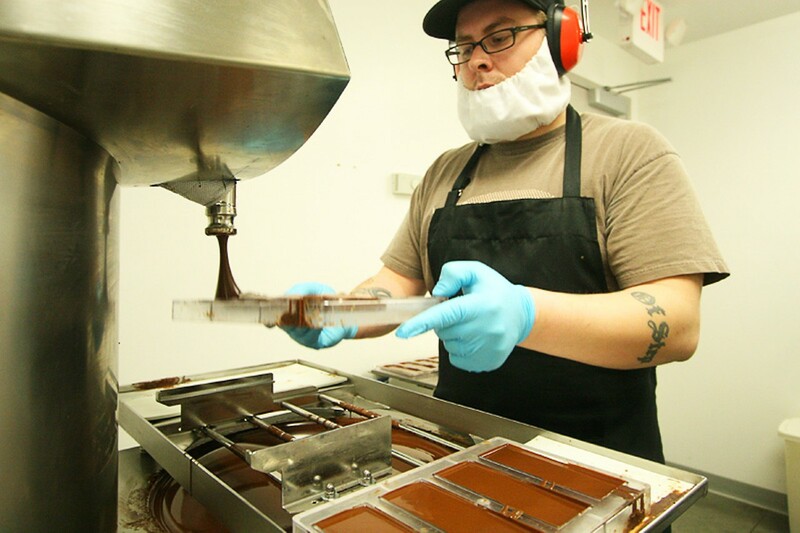 His goal is to make the best chocolate in the world because he has a love of the process. I love the process because I love the product." He breaks off a square of a bar from a small California chocolate company and pops it in his mouth. "This is nutty, roasty and flat," he announces. "This is a 75 percent bar. It should be like a shot of espresso: It should be bright and wake you up and make you pay attention. 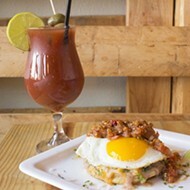 If it doesn't make your taste buds pay attention, something's wrong." These days, says Gordon, chocolate does approximately $16 billion in annual sales in the United States. Of that, $1.6 to $2 billion is premium chocolate, though that number also includes confectioners like See's Candies, Godiva and Ghirardelli. He expects the gourmet market will only continue to grow. "Every community large enough to support a craft brewer is large enough to support a craft chocolate maker," he declares. Askinosie, recalling the difficulties he had obtaining his machinery, is dubious. McClure thinks it's not such a far-off possibility. "Some people get too excited too quickly, before they realize what they're getting into," he says. "Is now, especially with the recession, the best time [to start a chocolate company]?" McClure asks. "No. Five years ago was the best time. But people will find a way to get the equipment, and the more people who find a way, that will prove there is a way."